Hey Guys! Enjoy once again plenty of delicious and tasty dishes with this Diamond Hotel 50% Promo on lunch buffet at Corniche, Yurakuen, Lobby Lounge, Sky Lounge and The Cake Club restaurants. Just visit any of these food establishments and enjoy mouthwatering lunches from May 19 until August 30. Remember, you can get Php 2000 Dining Voucher for only 1000 pesos. Its a truly amazing deal right?! Take note! You must buy your vouchers starting May 13, 2015 up to May 18, 2015 only. 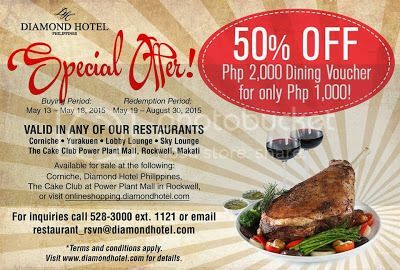 This Diamond Hotel Promo for 2015 can be availed at Corniche, Yurakuen, Lobby Lounge, Sky Lounge and The Cake Club. For any questions or clarification you may contact 528-3000 ext. 1121 or email restaurant_rsvn@diamondhotel.com for any inquiries you might have.